Dalio made the remarks in a panel discussion at the World Economic Forum’s annual meeting in Davos on Tuesday where he reiterated that a limited monetary policy toolbox, rising populist pressures and other issues, including rising global trade tensions, are similar to the backdrop present in the latter part of the Great Depression in the late 1930s. Before you dismiss Dalio’s view Bridgewater’s Pure Alpha Strategy Fund posted a gain of 14.6% in 2018, while the average hedge fund dropped 6.7% in 2018 and the S&P 500 lost 4.4%. “In our opinion, the Fed’s new warm and cuddly tone is all about supporting the stock market. The market fell nearly 20% from record highs in the fourth quarter and fear set in. There is no doubt President Trump’s tweets along with strong advisement from the shareholders of the Fed, the large banks, certainly played an influential role in persuading Powell to pivot. Speaking on CNBC shortly after the Powell press conference, James Grant stated the current situation well. As Mike correctly notes, all it took for Jerome Powell to completely abandon any facsimile of “independence” was a rough December, pressure from Wall Street’s member banks, and a disgruntled White House to completely flip their thinking. However, while the markets are celebrating the very clear confirmation that the “Fed Put” is alive and well, it should be remembered these “emergency measures” are coming at a time when we are told the economy is booming. “We’re the hottest economy in the world. Trillions of dollars are flowing here and building new plants and equipment. Almost every other data point suggests, that the economy is very strong. We will beat 3% economic growth in the fourth quarter when the Commerce Department reopens. We are seeing very strong chain sales. We don’t get the retail sales report right now and we see very strong manufacturing production. And in particular, this is my favorite with our corporate tax cuts and deregulation, we’re seeing a seven-month run-up of the production of business equipment, which is, you know, one way of saying business investment, which is another way of saying the kind of competitive business boom we expected to happen is happening.” – Larry Kudlow, Jan 24, 2019. Of course, the reality is that while he is certainly “spinning the yarn” for the media, the Fed is likely more concerned about “reality” which, as the data through the end of December shows, the U.S. economy is beginning to slow. 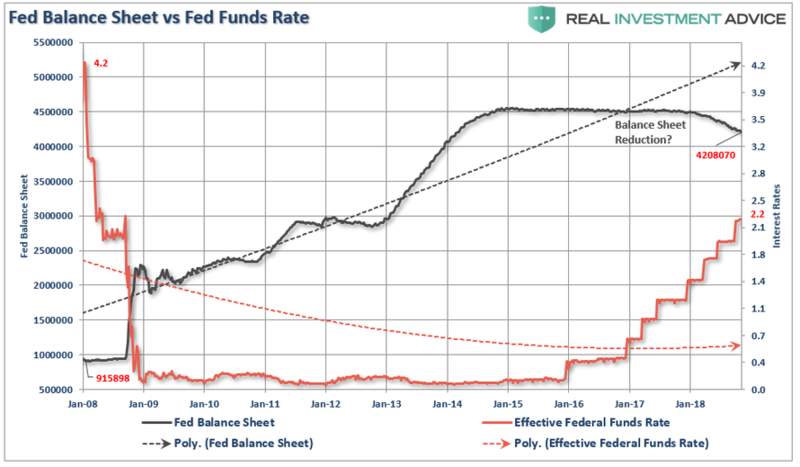 “In 2008, when the Fed launched into their “accommodative policy” emergency strategy to bail out the financial markets, the Fed’s balance sheet was only about $915 Billion. The Fed Funds rate was at 4.2%. But it isn’t just the issue of the Fed’s limited toolbox, but the combination of other issues, outside of those noted by Dalio, which have the ability to spur a much larger. The nonprofit National Institute on Retirement Security released a study in March stating that nearly 40 million working-age households (about 45 percent of the U.S. total) have no retirement savings at all. And those that do have retirement savings don’t have enough. 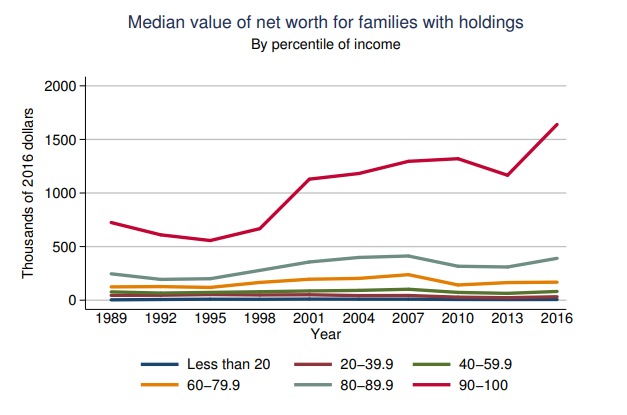 As I discussed recently, the Federal Reserve’s 2016 Survey of consumer finances found that the mean holdings for the bottom 80% of families with holdings was only $199,750. Such levels of financial “savings” are hardly sufficient to support individuals through retirement. This is particularly the case as life expectancy has grown, and healthcare costs skyrocket in the latter stages of life due historically high levels of obesity and poor physical health. The lack of financial stability will ultimately shift almost entirely onto the already grossly underfunded welfare system. 78 million Americans are participating in the “gig economy” because full-time jobs just don’t pay enough to make ends meet these days. In 2011, the average home price was 3.56 times the average yearly salary in the United States. But by the time 2017 was finished, the average home price was 4.73 times the average yearly salary in the United States. In 1980, the average American worker’s debt was 1.96 times larger than his or her monthly salary. Today, that number has ballooned to 5.00. In the United States today, 66 percent of all jobs pay less than 20 dollars an hour. 102 million working age Americans do not have a job right now. That number is higher than it was at any point during the last recession. Earnings for low-skill jobs have stayed very flat for the last 40 years. Americans have been spending more money than they make for 28 months in a row. In the United States today, the average young adult with student loan debt has a negative net worth. At this point, the average American household is nearly $140,000 in debt. Poverty rates in U.S. suburbs “have increased by 50 percent since 1990”. Almost 51 million U.S. households “can’t afford basics like rent and food”. The bottom 40 percent of all U.S. households bring home just 11.4 percent of all income. According to the Federal Reserve, 4 out of 10 Americans do not have enough money to cover an unexpected $400 expense without borrowing the money or selling something they own. 22 percent of all Americans cannot pay all of their bills in a typical month. Today, U.S. households are collectively 13.15 trillion dollars in debt. That is a new all-time record. Here is the problem with all of this. Despite Central Bank’s best efforts globally to stoke economic growth by pushing asset prices higher, the effect is nearly entirely mitigated when only a very small percentage of the population actually benefit from rising asset prices. The problem for the Federal Reserve is in an economy that is roughly 70% based on consumption, when the vast majority of American’s are living paycheck-to-paycheck, the aggregate end demand is not sufficient to push economic growth higher. While monetary policies increased the wealth of those that already have wealth, the Fed has been misguided in believing that the “trickle down” effect would be enough to stimulate the entire economy. It hasn’t. The sad reality is that these policies have only acted as a transfer of wealth from the middle class to the wealthy and created one of the largest “wealth gaps” in human history. 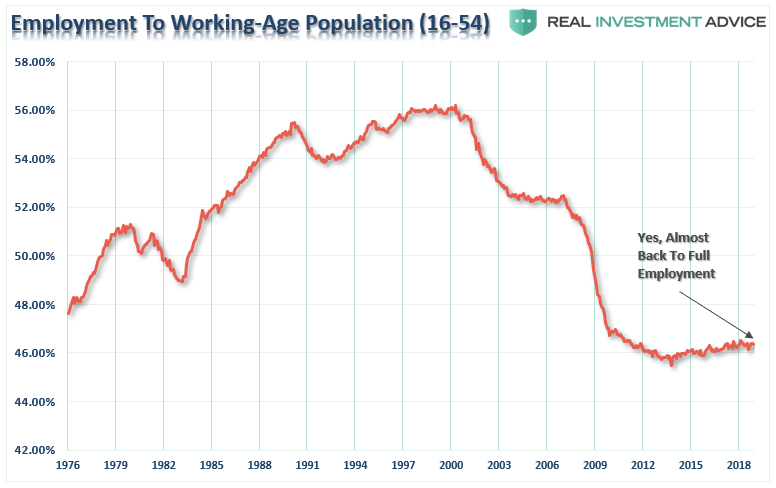 The real problem for the economy, wage growth and the future of the economy is clearly seen in the employment-to-population ratio of 16-54-year-olds. This is the group that SHOULD be working and saving for their retirement years. The current economic expansion is already set to become the longest post-WWII expansion on record. Of course, that expansion was supported by repeated artificial interventions rather than stable organic economic growth. As noted, while the financial markets have soared higher in recent years, it has bypassed a large portion of Americans NOT because they were afraid to invest, but because they have NO CAPITAL to invest with. 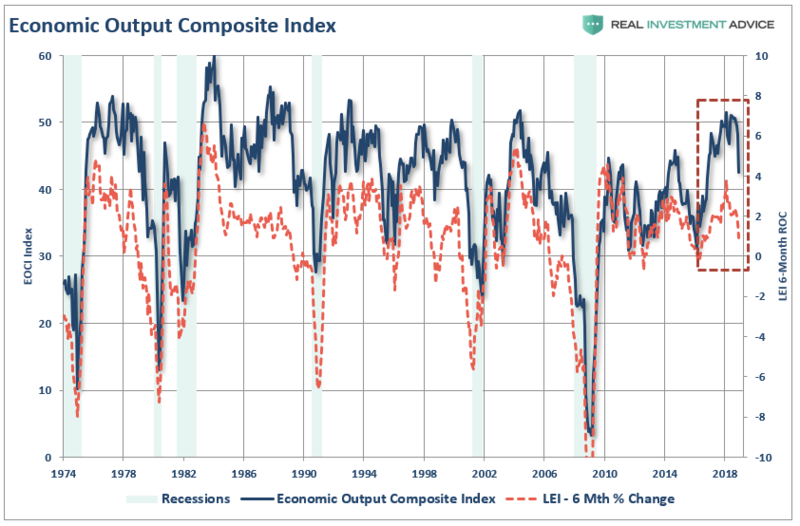 To Dalio’s point, the real crisis will come during the next economic recession. While the decline in asset prices, which are normally associated with recessions, will have the majority of its impact at the upper end of the income scale, it will be the job losses through the economy that will further damage and already ill-equipped population in their prime saving and retirement years. Furthermore, the already grossly underfunded pension system will implode. An April 2016 Moody’s analysis pegged the total 75-year unfunded liability for all state and local pension plans at $3.5 trillion. That’s the amount not covered by current fund assets, future expected contributions, and investment returns at assumed rates ranging from 3.7% to 4.1%. Another calculation from the American Enterprise Institute comes up with $5.2 trillion, presuming that long-term bond yields average 2.6%. 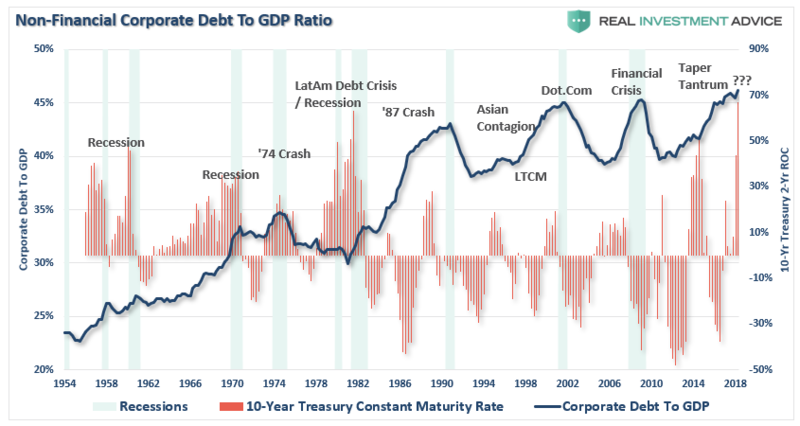 The massive amount of corporate debt, when it begins to default, will trigger further strains on the financial and credit systems of the economy. Dalio’s View Is Likely Understated. The real crisis comes when there is a “run on pensions.” With a large number of pensioners already eligible for their pension, the next decline in the markets will likely spur the “fear” that benefits will be lost entirely. The combined run on the system, which is grossly underfunded, at a time when asset prices are dropping will cause a debacle of mass proportions. It will require a massive government bailout to resolve it. But it doesn’t end there. Consumers are once again heavily leveraged with sub-prime auto loans, mortgages, and student debt. When the recession hits, the reduction in employment will further damage what remains of personal savings and consumption ability. The downturn will increase the strain on an already burdened government welfare system as an insufficient number of individuals paying into the scheme is being absorbed by a swelling pool of aging baby-boomers now forced to draw on it. Yes, more Government funding will be required to solve that problem as well. As debts and deficits swell in the coming years, the negative impact to economic growth will continue. At some point, there will be a realization of the real crisis. It isn’t a crash in the financial markets that is the real problem, but the ongoing structural shift in the economy that is depressing the living standards of the average American family. There has indeed been a redistribution of wealth in America since the turn of the century. Unfortunately, it has been in the wrong direction as the U.S. has created its own class of royalty and serfdom. The issue for future politicians won’t be the “breadlines” of the 30’s, but rather the number of individuals collecting benefit checks and the dilemma of how to pay for it all.